As I previously reported, the Yahoo homepage — which is a mix of mobile-friendly online styles from Microsoft’s Windows 8 to Flipboard to Pinterest — is close to its official launch, perhaps as early as this week, according to sources close to the situation. Here is the latest version that is appearing in some browsers — this one in Mozilla’s Firefox, for example — that looks a lot like previous versions I have posted. The touchscreen-tiled approach seems to be the favored design, which seems to be aimed at being consumed on touch-responsive, non-PC devices. Also part of the look, which is still being tweaked, as I have previously written: More simplified icons for various Yahoo properties, fewer text links, additional social and personalization aspects. The latest redo is now being iterated under the regime of new CEO Marissa Mayer, under the code name Project Homerun. Mayer declared in a recent earnings call — articulating what many desktop-trapped Silicon Valley Internet giants have also done recently — that Yahoo was going to veer toward a “mobile first” sensibility. “Yahoo will have to be a predominantly mobile company,” she said. Indeed, judging by the looks of what’s going on below, which seems to have no advertising at the top part of the screen. Sources tell me that ads could be integrated into the tiled module — it’s an important element of the redo, since the “front door” of Yahoo is its most important monetizable page. 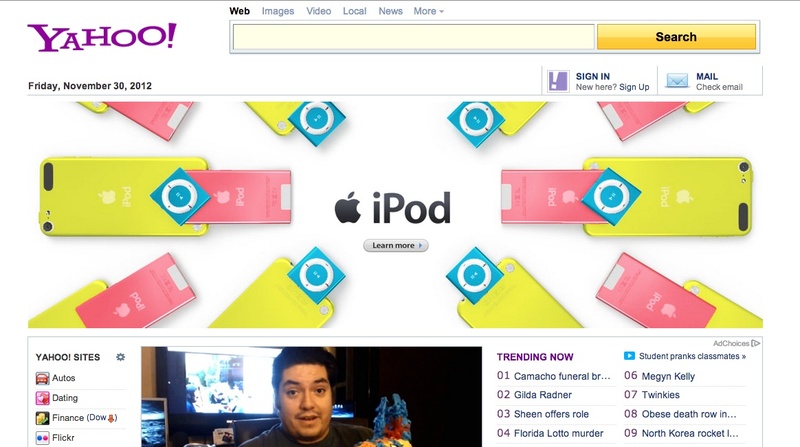 Speaking of which, I also included below the new homepage look a recent “push-down” ad on the homepage, which took over the entire top and did all kinds of interactive dancing with Apple products. 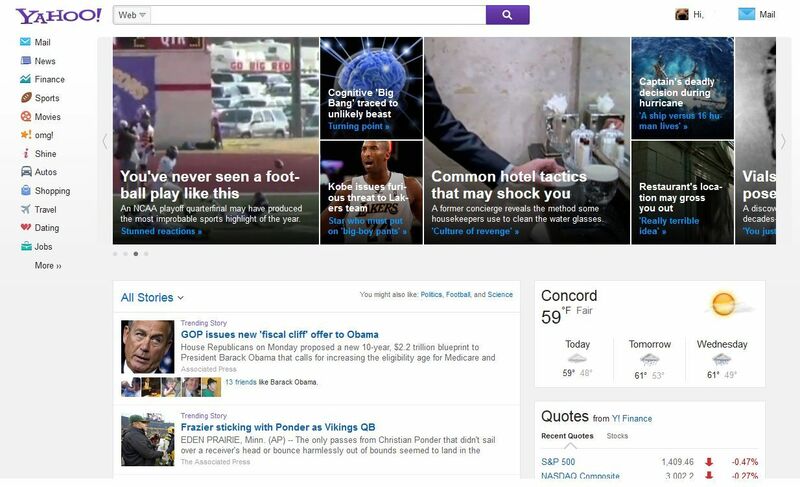 It is more intrusive than usual, and an interesting development for Yahoo.